Recently I received a new pair of Danner Fort Lewis boots. 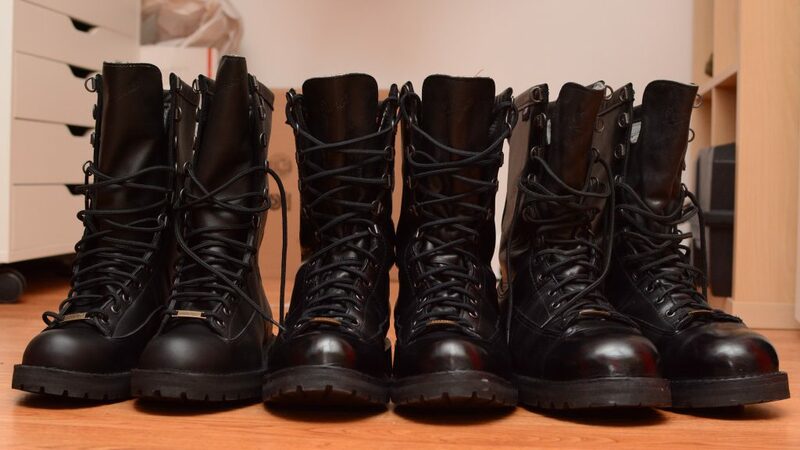 Fort Lewis have long been one of my favorite pair of boots. I love the height, feeling them reach 10″ up my calves. I also love that they are all leather. It is also a nice feature that the upper eyelets are D-rings which easily accommodate a padlock, for those who are so inclined to such things. One of the advantages to being all leather is that they can be polished with traditional Kiwi wax polish to take on various levels of shine. The high quality leather also makes it possible to (carefully) add wax to parts of the boot other than the toe without it becoming an absolute mess. In the past I have always polished my leather boots, but with this new pair I’m trying to decide if that is something I want to do. I like the look of the bare leather and with a bit of conditioning it would be perfectly nice to break in. An advantage to the wax polish is that it provides a layer of protection to the leather to prevent scuffs and scratches to the leather itself. One thought that has occurred to me is to apply a small amount of wax, just enough to create a thin layer for protection, without taking the boot to a high shine like my other Danners. Leaving the new pair unpolished will make them stand out from my current boots and be a slightly different look that I can wear with jeans or other casual pants.